Hundreds of years ago the Chinese developed a new fruit by crossing a lemon and either a mandarin or an orange tree, no one knows for sure. PCR and DNA sequencing could definitely solve this puzzle, but as far as I know, this research hasn’t materialized yet. The fruit, introduced in the USA in 1908, is the Meyer lemon, and once you try it, you understand why people go crazy when they show up in farmers’ markets and grocery stores. I’ve been using them often these days, absolutely in love with their flavor, which is often described (quite accurately) as floral. This pasta came together quickly for a delicious weeknight dinner. My inspiration was a recipe published in a recent Fine Cooking issue (number 108, the one with the beautiful croquembuche on the cover). Heat the olive oil and the butter in a large skillet in medium heat. Add the minced leeks, cook until softened, season lightly with salt and pepper. Increase the heat to high and add the artichoke pieces (no need to defrost if frozen), and the red pepper flakes. Cook without moving them too often, so that a nice golden brown color develops. Remove from the heat, add the lemon zest and reserve. In a small bowl, mix the ricotta, mascarpone cheese, the basil, and the lemon juice. Season lightly with salt and pepper. Cook the pasta in plenty of salted boiling water, reserve 1/4 cup of the cooking liquid, drain the pasta and place back in the pan. Add the ricotta mixture, stir very well to combine. If too thick, add some of the pasta water. 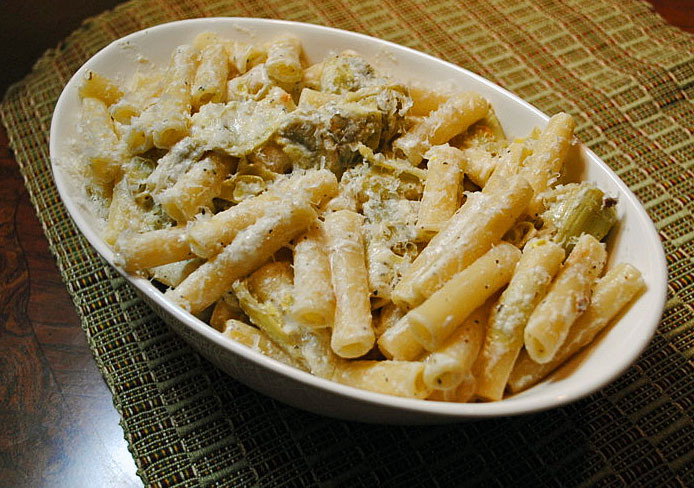 Finally, gently incorporate the artichokes, and serve, with Parmiggiano cheese grated on top. Comments: The original recipe called for 4 different types of cheese and several herbs. I wanted a dish a little lighter and simpler, so that the Meyer lemon had a better chance to shine. It worked quite well, I am already a bit sad that their season won’t last forever. Carpe diem, my friends. Carpe diem.